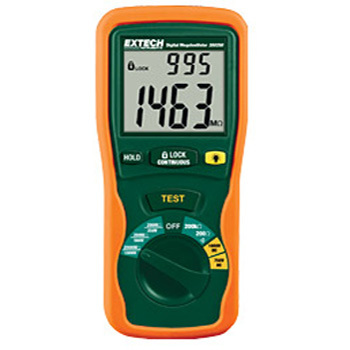 Extech 380260- Autoranging Digital Megohmmeter – Infinity HVAC Spares & Tools Pvt. Ltd.
250V, 500V, and 1000V test voltages. Lo Ohm function for testing connections. Lock Power On Function for hands-free operation. Data Hold to freeze displayed reading. Complete with heavy duty test leads, alligator clip test lead, 6 x AA batteries, hanging strap and hard carrying case.